BMW has announced that starting as soon as July 2013, some of its models will be fitted with a built-in SIM card that allows owners to pick and choose infotainment options and programs, rather than buy an expensive tech package, which may or may not include all the features they want and plenty they may never use. Don’t think this means the days of expensive BMW tech extras are over. Instead, BMW owners will be able to log in to the ConnectedDrive and pay what we assume will be an arm and a leg for apps and other features. The BMW ConnectedDrive store will be accessible either in-car or from your home computer. For the update, BMW has created a new browser as well as many app-ready applications, which BMW brags opens up users to virtually endless options of infotainment. Additionally BMW offers access to over 12-million songs and over 250 professionally created music channels. Cleverly, with these new apps and features, BMW offers limited-run subscriptions. You can access a new feature for as little as a month or even over a year, if you like. We like this because we hate the idea of buying into a year contract only a month later realizing you don’t need the program or feature any longer. 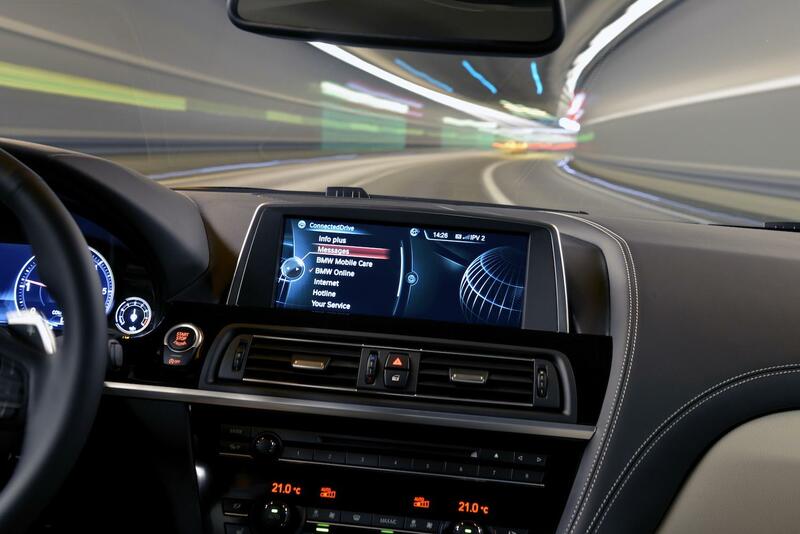 Following European Union law, all BMWs will have feature an advanced Emergency Call system, which will include precise vehicle location services as well as accident severity reporting. It looks like cars are quickly becoming as adaptable and as adept at personalization as our smartphones. We’re quite pleased with this. Now if only we could convince BMW to move away from the iDrive single-point interface setup, we’d be set.